We had "halloween party bis" today, with many more students than Thursday. Three shifts of children: trick-or-treat (to a classroom where I try to act scary - channelling my uncle), games, snacks, etc. Here I am with 2 coworkers and kid-as-batman. We were having a halloween party for the elementary kids this evening. The Thursday group is quite small, these days. Two girls came running from the "movie room" back into our "store" - where we sold the kids food and snacks and stationary for their fake money as collected from various teachers. Razel, a teacher, asked the girls, "Is it a scary movie?" Fay, a student, answered, "Nah. Scary teacher." THIS WORLD IS FULL OF BEAUTY. And, if we did our duty, it might be as full of love." This was a clever and humorous video I ran across recently. Each of us is immortal up until the moment of our death. Still being sick, I had an exhausting day. I failed to post this in a timely fashion (meaning I failed to stick to my one-post-a-day schedule for the first time in a very long time), so I'm putting it up late, and back-dating it. Chris, a sixth-grader, was doing a writing test. He was doing something weird with his fingers on his skull. It looked like a cross between a secret handshake and a massage. "What are you doing, Chris?" I asked, gesturing at his hands. "I'm thinking with my fingers," he explained. "I really do not know that anything has ever been more exciting than diagramming sentences." - Gertrude Stein. I am so sick. I had a difficult, day, too. I worked for 4 and half hours and came home only to find that the battery had died in my door lock. I have one of those electronic door locks that prevail in Korea. My previous experience with the battery dying in the door lock is that the gadget gives some warning. They start to beep at you in weird, alarming patterns when they're getting low, prompting you to check their battery. But in this event, there had been no warning. Just a dull half-beep and no response when I keyed in my code - it was clear it was a dead battery, though. The problem is that when I took this apartment, I never received a manual, old-style key. There wasn't one, I guess. That's easy enough to believe - misplaced and never replaced. So I was locked out of my apartment. I felt rotten, just wanted to crash after work, I had a heavy bag of groceries I'd bought at the store on the way home. The building doorman downstairs made clear this was not something in his control - the building doesn't keep master keys to the apartments. That's not the way it's done. I had to call the landlord (hah... I don't even know who that is - it's anonymous through the real estate management company through my boss Curt - too many layers of middle-men to even contemplate). Or I could call a locksmith - that's what normal people did. I called Curt, and he reiterated the same. I got the doorman to call the locksmith - I was feeling my usual telephone-in-Korean anxiety, and while I can communicate in Korean somewhat effectively face-to-face when required to do so, I hate trying to do so on the phone. I don't even like talking on the phone in English, anymore. As an aside, what's with my telephone anxiety, anyway? I like talking in person, well enough, after all. My student Jack recently commented, "Teacher, why do you like to talk so much?" But hand me a telephone, and I suddenly feel like I have some kind of handicap. I hate phones. Does this make me an honorary "millenial"? I read recently that millenials believe important communication should be by text or via social media like facebook or, worse-case-scenario, via email. "They" (millenaials, as a statistical collectivity) apparently believe talking on the phone is a waste of time and is for losers. I waited about 20 minutes, and the locksmith came, and he tinkered around with it for almost 30 minutes, before declaring that he would have to break the lock. I had wondered if it would come to that. I knew that would make it expensive, since then it would have to be replaced. But I really, really just wanted to get into my apartment and start my weekend of convalescing from this horrible cold I have. I sneezed and coughed and assented to 200,000 won (200 bucks). He broke the lock, and while he spent the next hour replaceing the lock he'd broken, I did my dishes and picked up some things, and as soon as I'd paid him and he left, I took some ibuprofin and decongestant and passed out. I just woke up. I hate sleeping in the afternoon on days off, because it messes me up with respect to my normal afternoon work schedule. I just couldn't not sleep. Caveat: Do you know the ghost community? I have been struggling with a suddenly really bad cold/flu thing this week, while carrying a rough and intensive inter-naesin teaching schedule. I'm exhausted, and feeling like a zombie-teacher. Sufjan Stevens, "They Are Night Zombies!! They Are Neighbors!! They Have Come Back from the Dead!! Ahhhh!" A truly weird song. About Illinois. And Zombies. Or something. ...Actually, after just a brief googlification, I wonder if it's about that notorious and supposedly excellent TV series, Walking Dead, which I personally don't enjoy, despite finding its themes and approach interesting. Or maybe some other pop-cult zombie-fare. In fact, this is a bit of a joke. The Korean I wrote is [paiting] which is, in fact, derived from the English "fighting" (via Japanese). But it is used to mean "work hard" or "keep trying." A student like Giung, however, with his high English comptency and ironic sense of humor, was likely to understand I was punning on the fact that he'd told me that he fought with his parents. In fact, he did - he was explaining what I wrote to the other students in class, today. I was walking home, just now, and I just happened to notice a scrap of paper on the sidewalk, a block or so from work. It was a slightly damp, torn fragment of one of my "alligator bucks," that I give to students as a form of reward points. I was surprised. The was not at work - it wasn't in front of work. Somewhere, some student of mine had lost a bit of his or her "money" out in the street. It felt strange - like my private economy that I maintain with my students was infiltrating into the outside, broader world. I felt sad, too - because the student's money was torn and this was only a bit of it. I imagined some struggle - two students fighting over it. ... Nah, probably not. My student Jack did a poor job at homework, once again. I was berating him, mildly, in the typical way expected of teachers in Korea: "Why are you like that, Jack? These other students do well." He shook his head, as if with world-weary sadness. "I am a mysterious man," he answered, and paused, looking up at me earnestly. Then he added, "... to myself." The joke was impressive for its timing, but more so when keeping in mind he is non-native-speaking 12 year old. Unrelatedly, the fall is most definitely here. The trees are changing in the pedestrian plazas on the path to work. World Order (Genki Sudo), "Have A Nice Day." My coworker taught me the term 중2병 [jung-i-byeong]. This might be most comfortably translated into colloquial American English as something like "8th-grader-itis" - meaning bad behavior in 8th graders due to their being eighth-graders. Literally, it's something like "2nd-year-middleschool-disease." Given that this is something I was struggling with, recently, it seemed a useful term to know. The Rural Alberta Advantage, "On The Rocks." "If no one comes from the future to stop you from doing it then how bad of a decision can it really be?" - This was circulating online, and as far as I can figure out it originated from Will Farrell (comedian). Some artist (or artist collective - I'm not clear which) has been launching bonsai trees on weather balloons to the edge of space as a sort of conceptual project. I think this is interesting in a very weird, utterly absurd and useless way. My student Soyeon, a third-grader, was arguing about how I was allotting points in class. When a student gets a wrong answer, I go to the next, and if that next student gets the right answer, that student gets the point. The exception, however, is if the question is binary choice: true/false, or only two choices a/b. If the first student is wrong, then I just announce, no, it's the other one, and we move to the next question. Soyeon either didn't realize this was my procedure, or felt it was unfair in some way. She was arguing with me. It was one of those passionate kid-arguments over something seemingly trivial - she seemed on the verge of tears. So I took the time to try to explain the procedure. I went back over the last few questions we'd done in the workbook, showing how for the true/false ones, we'd simply moved on. She seemed to be understanding, but she still was saying "It's not fair." Her English is remarkably good, actually. Finally, I said, "I think you just like to argue." She sat back. "No. I don't." "Really, you like to argue." "No! It's not true. I don't like to argue." She sat back, though, thinking this through. I knew that she knew and was comfortable with the word "argue" as she'd used it earlier, correctly, talking about the story we were reading. There was no real resolution. We moved on. But at the end of class, she said very cheerfully, "Bye!" so I guess she got over it. "Fun is an artificial construct," according to Steven Patrick Morrissey, former front-man for The Smiths. Apparently he has recently been struggling with cancer, which is something I can relate to, and this perhaps indirectly lead him to the above conclusion, which he stated to a Spanish journalist will on tour in Spain. This seems perfectly suited to the morose persona Morrissey has long cultivated, but I'm willing to concede the premise. The Smiths, "Heaven Knows I'm Miserable Now." In the 1st/2nd/3rd grade elementary class, we were talking about sports. Simple sentences: "I like to play soccer." "I like to run." "I kick the ball." We were talking about things you can like to do in sports. "Elizabeth," I said. "What do you like to do?" "I like to kick the ball." "Junseo, what do you like to do?" "I like to kick the ball too." Chloe jumped up, raising her hand. "I like to kick," she announced. "What do you kick?" I asked, hoping she could complete it with an object, like "ball." She obliged. "I like to kick my family." Yesterday was a day off - "hangeul day" was a holiday in the past but then it was no longer formally observed through the 1990s and 2000s, but last year it became an official holiday again. I didn't do much, but my friend Peter visited Ilsan with a friend of his and we had some Thai food over at Western Dom, in the evening. I'm feeling overwhelmed by work, now. But does it feel like you're already dead? (YES!) and do you feel like your brain stopped delivering? Yeah break my finger shoot out my black eyes, What does it matter if everyone dies? Hey Kemosabe I'm alone! Ayah! I am a! I am alone! So fast hence take an arrow from your quiver or we're, past-tense - what's a trilobite to anyone? I put my fingers in lead, And I breeze past security! And I'm looking at a holy ghost. Hey Kemosabe I'm alone! Ayah! I am a! I am alone! Hi-O silver away! Mmm, and I'm lost and I'm drained... 'nuff genuflecting in a penitent way! Hey Kemosabe I'm alone! Ayah! I am a! I am alone! So yippee-kayay! against the side of our wickered, penitential house. astounded the salt waves, the plush coast. hunkered there in its gully of learning. the whole afternoon lambent, corrugated, puddle-mad. My 2nd grade student wrote me this note. It says 블라블라 주기주기 어쩌고저쩌고 [beullabeulla jugi jugi eojjeogojeojjeogo] - which are just nonsense syllables. It is signed, 메롱 [merong], which is Korean for nya-nya. A child after my own heart. In fact, it was a pretty awful day. Now that I am teaching middle schoolers again... I have this pair of class clowns, Brian and Charles. They are quite smart, high level English speakers. But they know how to piss me off, and enjoy doing it as a form of entertainment, for themselves and to impress their peers, since I am mostly viewed as being pretty level headed in the classroom. Today I left the classroom for a moment, and they locked the door. Great fun. Later, when I put them in front of the 부장, they did their standard innocent-boy song and dance, very good with all the appropriate deferentials and humble vocabulary that Korean provides, and as always there was no punishment or consequence. I have this feeling that my colleagues somehow see them as different students than I do, mediated as it is through the lens of their own language and culture. Later I talked for a long time with Curt about it. He knew it was upsetting me, because I rarely go to him with this sort of issue. But resolution was inconclusive, anyway. He ended up hurting my feelings. We were trying to discuss the boys' personalities... talking about adolescent selfishness, etc. Curt said that I was selfish too. And in fact I know it is true. I persist in being selfish in a kind of Ayn Randian sense, although I long ago rejected that sort of philosophy - old habits die hard, and all that. Further, Koreans seem to view selfishness as a defining trait of all Americans, as much to be admired as disapproved of. Despite those things, still my feelings managed to be hurt. A bad teacher. A selfish person. The First Edition (with Kenny Rogers), "Just Dropped In." Yesterday evening, I was reading one of my history books and was falling asleep, and had one of those super-quick, drift-asleep-then-wake-up-with-a-start dreams. I was riding on a bus (so many of my dreams involve traveling, but then, I've traveled a lot in my life). I looked out the window and there was no ground. It was like on a plane - but the bus was still "rolling" - I could feel it. There weren't clouds either: just no ground... a kind of emptiness, under the houses and fields and other cars. That's it. Just a dream-snapshot. I have been very disconnected, lately: feeling as if I'm floating above myself, too often (I mean, I get that feeling sometimes, all the time, but it has been more continuous). It is hard to explain - I associate it with a kind of low-grade dysphoria, I guess, but it doesn't have any of the other characteristics one commonly associates with depression: no negative thinking or obsessive thoughts, no frustration or anger or boredom. Just a weird detachment. I'm not sure why I'm even writing about it, except to record it here for looking at later when I try to figure out what I was doing in this time. Donde cantan sin cesar los ruiseñores. Today was a holiday, but naesin is over so I have to work tomorrow. I walked a long route up to Gobong, and ended up in a very rural area behind the hill (the north side of it) that I had never seen before. There were some farms. 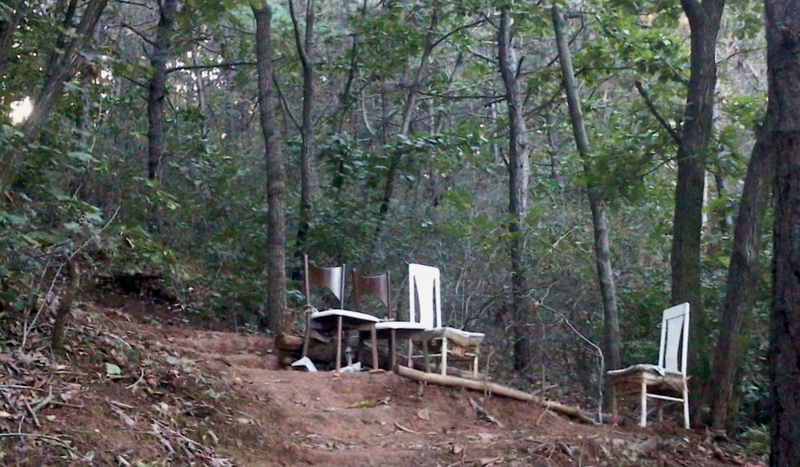 In the forest, I also saw the ubiquitous Korean fauna, Sedes koreanis. We were talking about how the dinosaurs became extinct in my Honors class this evening. We read some paragraphs in our writing book, and filled in some blanks from a listening exercise about various theories of what killed the dinosaurs: giant volcanos, asteriods, or more gradual failure to adapt to climate change. We discussed some more, and then I had them write some summary of the different ideas. I said, summarize how the reading and the lecture disagree about how the dinosaurs died. I picked up one student's essay, and she had written, "Dinosaurs were killed by a theory." I don't know why, but I found this quite amusing, and took far too long trying to imagine how this might have worked. Perhaps the dinosaurs were more sentient than we realize, and they developed some cultural trait that led to self-destructive behavior. For example, they had a theory that if they dug very deep holes, they could find true spiritual happiness. So they dug deeper and deeper holes, until finally they reached the earth's magma, which erupted and destroyed them all. This would be the sort of theory that killed the dinosaurs. Meanwhile, I wonder... it may in fact be perfectly OK to say the Korean equivalent, because the relationships (agent, topic, actor, recipient-of-action, etc.) between the noun phrases in Korean sentences are clarified by the endings on those words, not by the inherent valences of the verbs, as in English (and largely, most other Indo-European languages, as I understand it). This is one of the linguistic differences that seems to cause so much confusion to Korean English learners, and why they are always saying things like "The dinosaurs died the asteroid," when the mean "The asteroid killed the dinosaurs." They know what they mean, they just don't get that English verbs have these semantic valences that must be filled correctly. That's my theory, anyway. I'll try not to let it kill me.